The other day I was remarking to a client how fast this year seemed to be progressing, as we were already well into March! This, in turn, made me think that this is, in some way, linked to what I do – ie: looking at calendars planning campaigns to appear sometime into the future, and the fact this makes time move at a rapid rate. This feeling of the passage of time is also facilitated by the ever changing media, both in how we make use of it as advertisers, and also in how we view, or interact with it, as consumers. Keeping abreast of the changes, trends and innovations is almost a full time job in itself! Nowadays we have stunning digital posters that allow us to run multiple pieces of artwork at different times of the day. We have posters that will interact with us and which can be used to deliver a product straight into our hands. Television used to primarily be the preserve of the big boys, the ‘national’ advertisers. Now, of course, thanks to the energy of people like Thinkbox and the broadcasters themselves, Television is ever more accessible to all but the smallest of clients. And of course SKY Adsmart allows us to connect right into peoples’ homes with a different commercial than one their neighbour may be viewing next door, and without spending the whole annual marketing budget. These are just some of the things we have now. Live streaming across the major social networks and Television is predicted (by ‘Marketing Week’, amongst others) to become mainstream following successful Facebook and Instagram trials. The boon that this would be for product launches and events is obvious. Then there’s Out of Home which will become ever more outlandish and interactive. 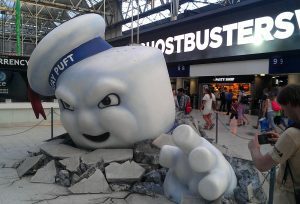 Who can recall the amazing SONY ‘Ghostbusters’ takeover of Waterloo station last year? The trend for synchronising content across media platforms will continue and advertisers will run the same content (like online videos) across social media, digital panels or mobile. This will enable more urgent, faster and more responsive campaigns that will reach out to consumers on many levels. It’s an exciting time to be an advertiser…..so let’s see what comes along next. Give us a shout at the office if you’d like to discuss a campaign.